June is National Camping Month and the perfect opportunity to spend time with friends and family while enjoying the great outdoors. 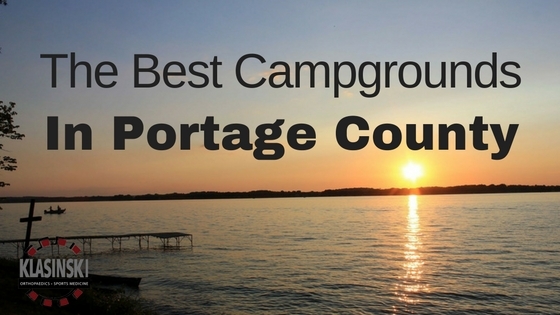 And you don’t have to go too far to find great camping right here in Portage County. So, grab the family and check out these campgrounds that are right in our backyard! This 143-acre park is located right next to Lake Emily, which provides easy access for fishermen, boaters, water-skiers, and swimmers. There’s a large picnic area for families, two enclosed picnic lodges, showers, a public boat access, playground equipment, nature trail, swimming beach, and baseball field. This is a great site for families and one of the most popular in Portage County. The campground is open from May 1st to October 31st and the north campground has 51 sites and the new south campground has a total of 15 sites. All sites except the tent sites are provided with electrical hookups and most sites can be reserved online by contacting the Parks Office. This campground offers 21 acres of wooded park and sits right next to Collins Lake. The whole family can enjoy fishing, boating, and swimming or just relax at any of the 27 campsites. Collins Park offers a picnic lodge, boat ramp, playground equipment, showers, and a small swimming beach, all of which are open to the public. The campground is open May 15th to September 30th and all sites are provided with electrical hookups. Most sites can be reserved online by contacting the Parks Office. Located next to the beautiful Wisconsin River, this campground offers a wide array of different events and activities. Spend the afternoon relaxing by the pool, take a walk on the nature trail alongside the Wisconsin River, or rent a bike/trike for an evening ride. The campground is open from May 1st to September 30th and no pets are allowed. Reservations can be made on the Rivers Edge website. There are so many wonderful campsites throughout Wisconsin, but if you are looking to stay close or just want to unwind for a couple days, these sites are perfect for an easy family getaway. So, go, get outdoors, and celebrate National Camping Month!